This wasn’t the recipe I’d intended to make. Initially, I skimmed past it because it contained (ominous music) cream and butter, our forbidden friends. I skimmed past a lot of recipes in Paul Bertolli’s gorgeous Chez Panisse Cookbook (book #3) ’cause oil, butter, cream…sigh. We’re also constricted by the fact that we live in semi-rural coastal Maine, and we can’t just pop down to the Berkeley Bowl for any unusual ingredients we might need. My first two choices had been fish soups. Glorious, complicated project soups. Given the proximity of the, you know, ocean, one would expect that there ought to be fish heads all over the place here, but nooo. None of our local-ish fishmongers had any whole fish other than salmon, which isn’t what I wanted (or, rather, Paul Bertolli wanted) for fish broth. 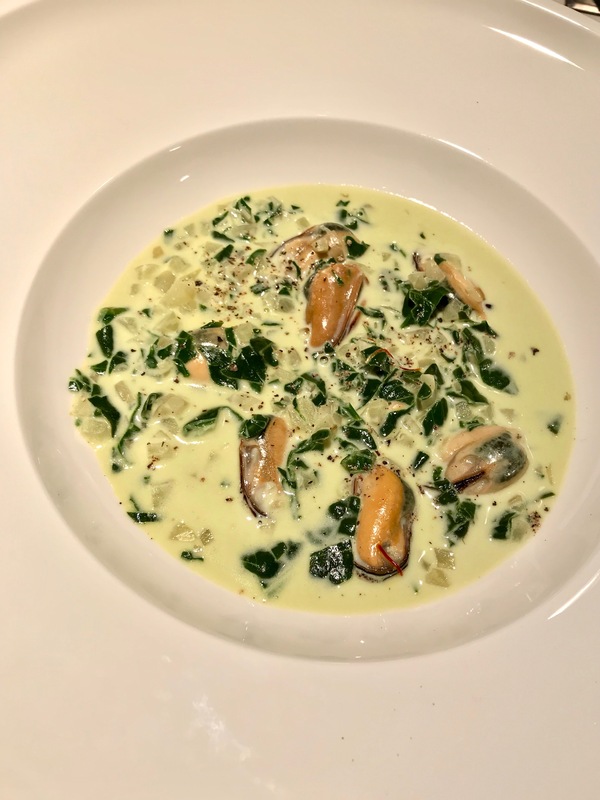 Starting to feel desperate, I re-read the seafood chapter again and decided that this mussel soup wasn’t as pointy as I’d initially estimated. And I’m glad I settled. This was outrageously delicious, and very simple. 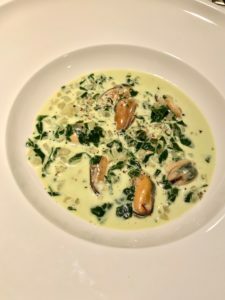 The mussels are steamed in wine and herbs, then you make a sauce with the wine, butter, cream, saffron, fennel and spinach. We got a new jar of Iranian saffron, and its perfume was heavenly. We’d toyed with making a full batch and freezing it, but wisely decided against it. 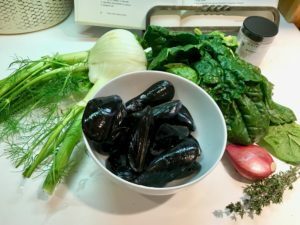 The servings in the recipe are fairly small, and there’s no way we wouldn’t have gobbled up the whole batch of mussel-y goodness. This is a DEFINITE make-again. It’d be a terrific first course for a dinner party. It’d also be good for lunch like, right now. 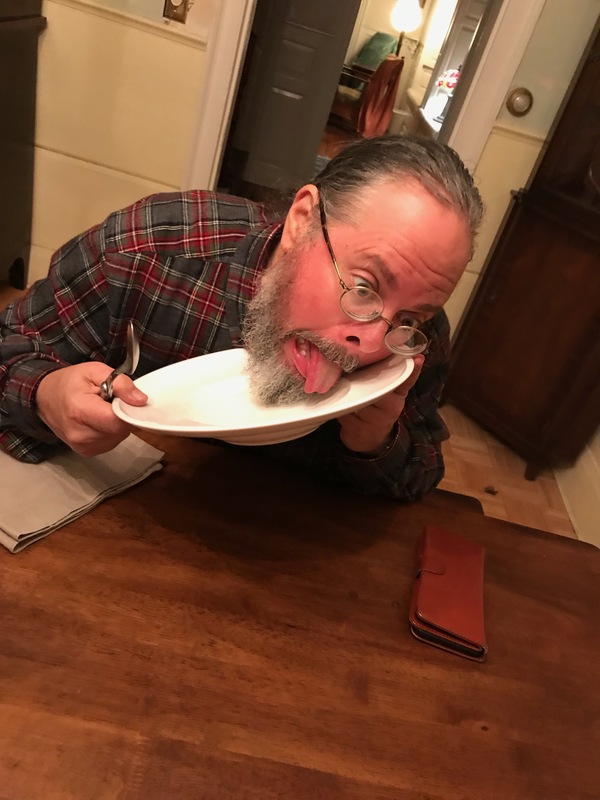 Next time we’re serving it with bread so we don’t have to lick the bowl. Next up: Alice Waters’ The Art of Simple Food II. Oh, and coincidentally, this time last year we were finally having dinner downstairs at Chez Panisse to celebrate Anton’s and my birthdays. It was…exceptional. If you can go, go. The power went out early in the meal, so the place was lit only by candles and by the massive brick oven in the kitchen. Alice herself came out and mingled with us all in the darkness. The experience could not have been more magical. I’m glad that we’re paying tribute to her vision this week. We also went to Chez Panisse this year for the first time. I enjoyed it more than all of the star restaurants we’ve been to.